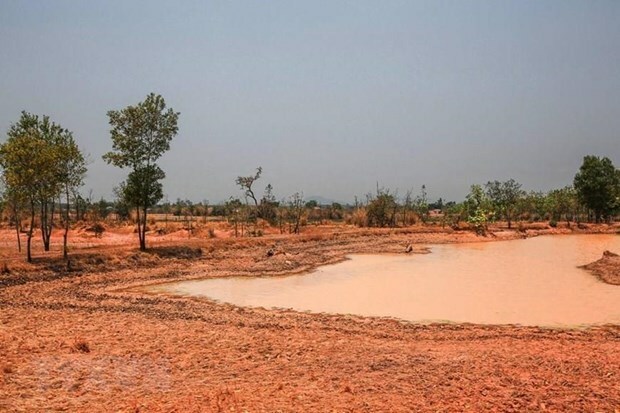 Hanoi (VNA) – More than 67,160 ha of farmland nationwide are likely to be hit by drought and saline intrusion in the coming time if a lack of rainfall persists, according to the Directorate of Water Resource under the Ministry of Agriculture and Rural Development. Currently, in the country’s north-central region, about 160 ha of the winter-spring crop in Thua Thien-Hue province are being hit by drought and saline intrusion. Meanwhile, up to 28,000 ha of crops in Vietnam’s central region may suffer risks of drought in the upcoming time, including those along the rivers of Ma in Thanh Hoa province, Ca in Nghe An and Ha Tinh, Gianh - Nhat Le in Quang Binh, Thach Han in Quang Tri and Huong in Thua Thien - Hue. In the Central Highlands, more than 3,000 ha of crops are facing water shortage, with 220 ha of those could be lost. Plants on around 37,000 ha of farmland could be adversely affected by unfavourable weather conditions, mostly in the provinces of Dak Lak, Dak Nong and Gia Lai. Similarly, nearly 6,000 ha of farmland in the south-eastern region localities of Binh Phuoc, Dong Nai and Ba Ria-Vung Tau are being in the same situation. The Directorate of Water Resources recently worked with relevant agencies on plans regulating reservoirs, in a bid to cope with drought and water shortage.